LinkedIn stock is taking a beating in after-hours trading right now, losing almost 30 percent of value after the company predicted revenue and earnings for the current quarter and for all of 2016 would be less than what analysts were forecasting. The prediction caused after-hours investors to bid down the stock to about $135, from its New York close at just over $192. After the market closed, LinkedIn released its fourth quarter and full year financial report for 2015, which had better than expected results. In both revenue and earnings per share, the outcomes exceeded expectations. LinkedIn reported fourth-quarter revenue of $862 million and profit of 94 cents per share, after adjustments. Wall Street was predicting 78 cents per share profit on $858 million in revenue. Normally, that would have sent the stock up at least slightly. But the company’s forecast of $820 million in revenue for the current quarter, and earnings per share of 55 cents was significantly below analysts projection of 74 cents per share on $867 million in revenue. The company’s full year guidance of $3.6-$3.65 billion and earnings of $3.05 to $3.20 was even further off the estimates. Company officials offered several reasons for the conservative growth estimates, including slower growth for LinkedIn’s recruitment products as a consequence of global economic conditions, particularly in Asia Pacific, Europe, Africa, and the Middle East. Closing an ad service LinkedIn obtained when it acquired Bizo will cost it $50 million. And revenue increases from new products were minimally budgeted, explained CFO Steve Sordello in prepared remarks. 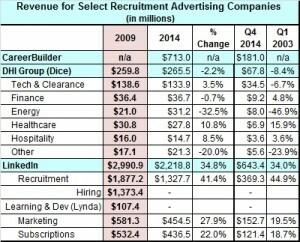 The recruitment sector is LinkedIn’s cash cow. For the year, it generated $1.9 billion, 63 percent of the $2.991 billion total. 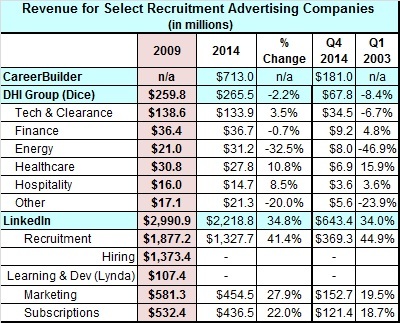 According to Sordello, LinkedIn had more than 42,000 contract recruitment customers at the end of December. Roll out the new Referrals product and an overhauled LinkedIn Recruiter to all customers. In addition to releasing its financial report, LinkedIn also announced it acquired Connectifier, a recruitment sourcing startup that has aggregate data on some 400 million candidates. Earlier this week, DHI Group, publisher of the tech career site Dice.com and several other niche job sites, reported earning 12 cents per share after adjustments on $65.1 million in the last quarter of 2015. For the full year, DHI earned 46 cents per share, down 5 cents a share from the year before. The company was hard hit by the downtown in the energy sector. Revenue at Rigzone, a careers site for the oil and gas industry, was down $10 million from 2014’s $31.2 million in revenue. Monster will release its financial report February 11. CareerBuilder is privately owned.